This is a reissue, not, as would first seem to be the case, a first issue. The original was issued by Nonesuch (Nonesuch 79542), and, although the CD is no longer available, parts can be heard online on the Nonesuch website. No notes are provided, to explain the provenance of the work. Facts in this review have been gleaned from elsewhere, but this listener, at least, is never a happy bunny when basic information is not given. But that is not a reason not to enjoy the issue. 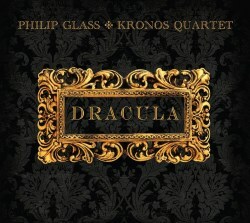 This is music for the film of Dracula, not as part of an original film score, as with Wojciech Kilar's superb score to the 1992 Francis Ford Coppola film of the story. Glass was commissioned to provide a live accompaniment to the 1931 Bela Lugosi film. His comment was: "Dracula is considered a classic. I felt the score needed to evoke the feeling of the world of the 19th century - for that reason I decided a string quartet would be the most evocative and effective. I wanted to stay away from the obvious effects associated with horror films. With Kronos we were able to add depth to the emotional layers of the film." The result is an enjoyable work characteristic of Glass compositions of the nineties. There is recourse to the usual pulsating rhythms, but also sensitivity, notably in '"Excellent, Mr. Renfield"'and 'In the Theatre.' 'Women in White' is very striking, not least for the varied effects over a single pulse, a little more animated than 'In the Theatre', with a touch of menace in rising and falling figures for the cello. There is a rival recording of the Suite from Dracula (not the complete soundtrack) from the Carluccio Quartet on Naxos 8.559766. Performances of eight movements are generally a little more spacious than those on the Kronos CD, and no less dramatic. The Naxos coupling is excellent - the Fifth Quartet and a String Sextet arrangement of the Third Symphony. The fuller Kronos recording has many merits as echt Glass, but the music itself, while very attractive, does not - for this listener, at least - much enhance our knowledge of the composer's development. But, if you like Glass, it will give much pleasure.